This year the kitchen colors is full of nuances. There is one for each effect. White, brown, black and pink will be available, but there are more alternatives. Look for them here and learn to combine them. If you’re a housewife, maybe you spend a lot of time in the kitchen. Convert it into a modern and beautiful room, with seasonal colors. The green furniture will look great on white walls. If you are looking for a quiet and cozy environment, the olive green will be the ideal. Gone are the “recycled” or boring decoration kitchens. This year the “stomach” of the home is full of nuances. The apple green is a safe alternative this 2020. Its joy and freshness will fascinate you, but if you prefer something more discreet, try the grayish green. Contrast with cream walls and stainless steel appliances will look aesthetic and elegant. Do you want more options? Then a long list, with their respective suggestions. Choose the one you like most! Are your shelves white and the kitchen illuminated? Then do not stop experimenting with a chocolate or coffee tone. You will give a more homely and warm finish to the room. If the brown is more opaque, balance with soft green or yellow brushstrokes. It will take more clarity. In cold weather places, a vibrant red in the cupboards looks splendid. You can intersperse with some doors in opaque green. If you have natural wood, cream or snowy cabinets, and do not want to waste them, choose an orange red for the walls. Of course, always seek harmony. If you exaggerate you will feel like you are inside an oven. Paint the wood of your shelves in black to modernize your kitchen. To the washing area will be fantastic this color. It will look like the stay of a professional chef. You will achieve a glamorous as well as minimalist finish. 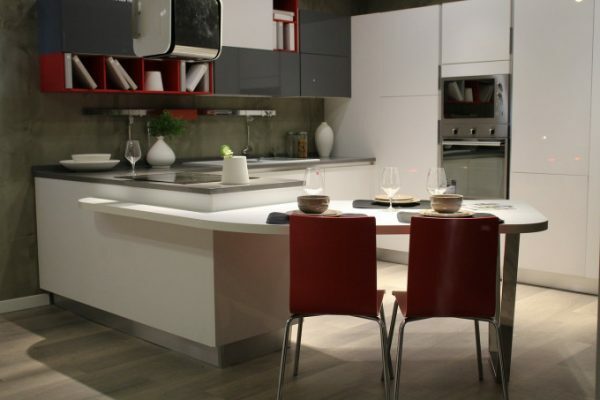 Contrast with white furniture, and put the final touch with gray appliances. If you also add plants, you will have sophistication and life in the same space. Lose your fear of orange! Pumpkin tone will completely chic your kitchen, especially if the opaque wood defines your shelves. Lavender, tangerine and turquoise highlight the versatility of gray in the kitchen. In addition, its metallic version combine perfectly with white lacquer. The effect? A modern kitchen, bright and inspiring freshness. Accenting some spaces is simple with straw colors. They are incredible in the cupboards or in some walls. For a relaxed and rural air, you can mix yellow with turquoise. The first one should go on top of the cupboards and the last one on the bottom. Keep in mind that light straw colors are fully adapted to a rustic decor. Discard the net white. Instead, lean towards the cream tones. Its warmth and tranquility will permeate your kitchen, and will match any style or color. Experiment with coffee or mint green. If you refuse to give up the target, use it to highlight the lines, the chiaroscuro or the shadows. Do not discard its application in the cupboards. That’s where it really stands out. You can even incorporate a bit of ivory, although they are very discreet tones, they work well enough. Add a little vivacity with accessories or plants. If you want to stay with the traditional, put the white on your walls, select marble countertops and dark wood furniture. The result will be classic, but very seductive. Elegance and warmth: use gray, orange and burgundy tones, combined with light-colored wood. More freshness for hot environments: the soft shades of green, blue or white are ideal for creating cooler rooms. Add luminosity incorporating silver and white in appliances. Sophistication: is what you get when merging black with opaque gray. You can also try the green bottle or navy blue. The pink powder merges with the gray to achieve an atmosphere worthy of a magazine. This kind of rose looks great with mustard. If you choose it you will have a kitchen that will attract all eyes. For its part, the old rose in the furniture will overflow elegance. As for the greens, both the olive and the hunter will conquer you. With them you can achieve a totally current environment, full of simplicity. It is the bet of minimalism on this occasion. Select blue for the furniture and gray for the walls if you intend to design a seductive stay. If you have dark tiles you will be fascinated with the result. Among so many modern and engaging options, the difficult thing will be to choose only one for your kitchen. Go ahead and wash your face in this vital space of your home. It is clear that the kitchens are dressed up in 2020.